FREE eBook DOWNLOAD JUNE 15- 19. 'Amazing Matilda: A Monarch's Tale,' an illustrated adventure story, reaches and teaches kids (ages 4-11) that friendship and success go hand-in-hand and that they can make their dreams come true. "Children of all ages will be able to relate to monarch's plight in some way... This story is a true gem and one that will inspire kids for years to come." Renee Hand, award-winning adult and children's book author. Hand reviews for the New York Journal of Books. Matilda doesn't want to leap onto ledges or bound across fields. She only wants to fly. 'How can a creature without wings every hope to fly?" Matilda's friends wonder as they laugh at the tiny caterpillar who only wants to fly. Meanwhile, as Matilda progresses from egg to butterfly, her friends begin to recall how they felt before they were able to do all of the things they had dreamed of doing. With a little help from her friends, Matilda learns that if she keeps trying, she can do anything that she really wants to do. 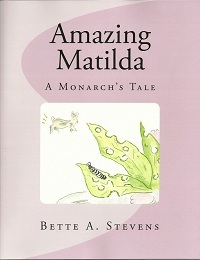 AMAZING MATILDA's storyline and illustrations follow the actual life cycle of the monarch butterfly and include milkweed, an environmentally near-threatened plant. Milkweed is the only plant that monarch caterpillars will eat.